The perfect balance of sweet and salty. We combine our Super Extra Large Virginia Peanuts with 100% pure honey then roast them to perfection. Just one taste and they will become your new favorite item. Virginia Diner produces the most exquisite Honey Roasted Peanuts that I've ever tasted! The peanuts are large and crunchy. Sweet to salty ratio is perfect. The best I've ever had! We received these peanuts as a gift. We absolutely loved them, we are hooked for life. Love love them...they are all gone. Delivery was on time. I will buy again. I am a huge fan of chocolate and the double dipped dark chocolate peanuts are amazing! Favorite chocolate candy ever! 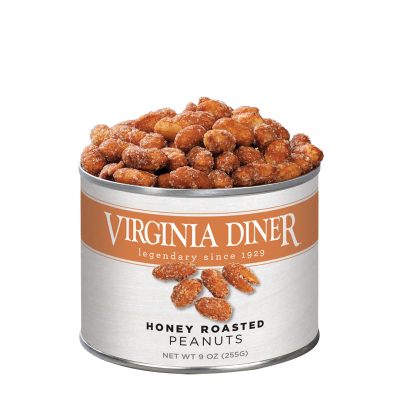 We bought VA Diner peanuts on a road trip two years ago and have been obsessed ever since. The honey roasted peanuts are amazing... so hard to not eat the whole can! Ordering was easy and shipping was quick. Order was ok. Goods delivered in good shape. Biggest issue was delayed shipping.